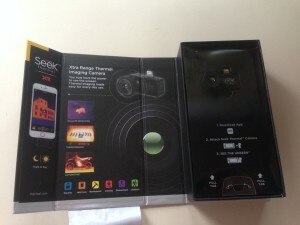 The Seek Thermal Compact thermal imaging camera is one of the most powerful devices for smartphones. There is a standard model* and an extended range version* for a price markup. 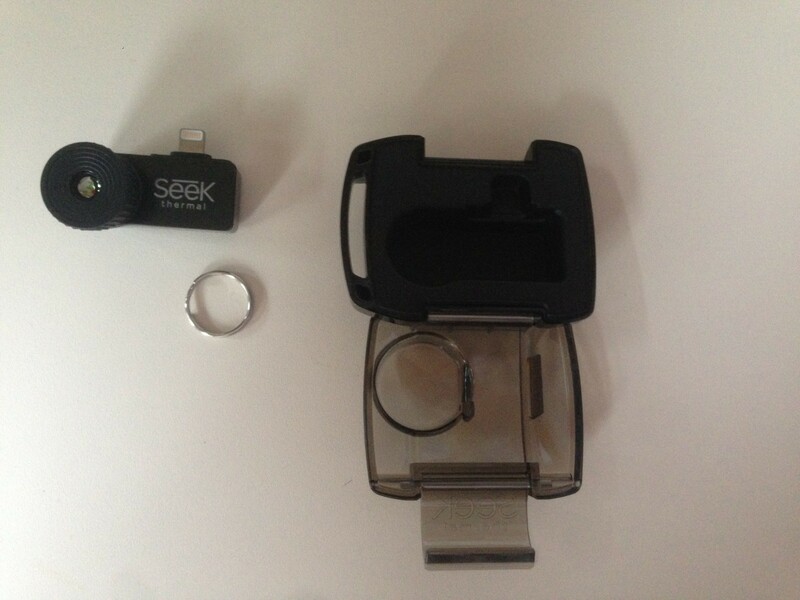 We have tested the device in detail and present the two variants in comparison. 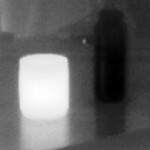 Learn more about possible applications, as well as the strengths and weaknesses of this thermal imaging camera for mobile phones! 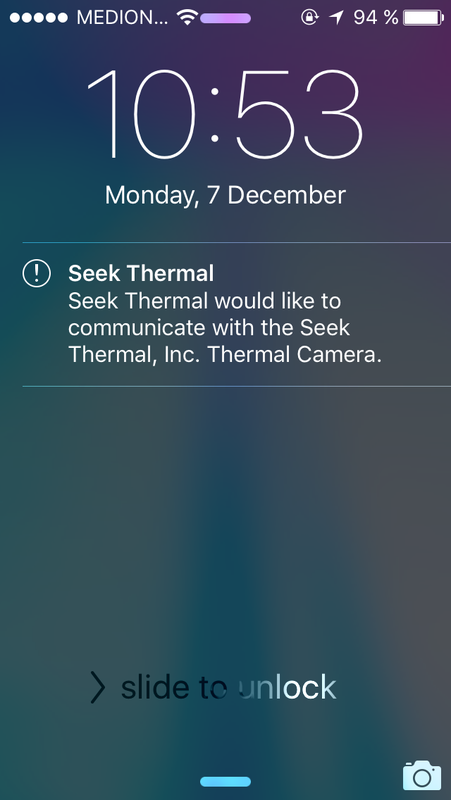 The Seek Thermal Compact is a thermal imaging camera plug-in for smartphones like the iPhone and already provides an amazing performance. It has been developed in California, USA and has been available since 2015. 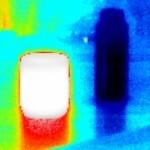 The target group is technology enthusiasts and those interested in thermography. 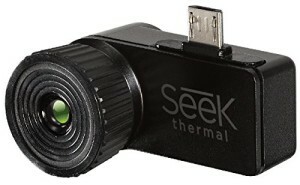 The Seek Thermal is also the right choice for those who need a compact IR device to take home. 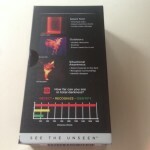 The manufacturer Seek has expanded its product portfolio with the “Seek Reveal”. 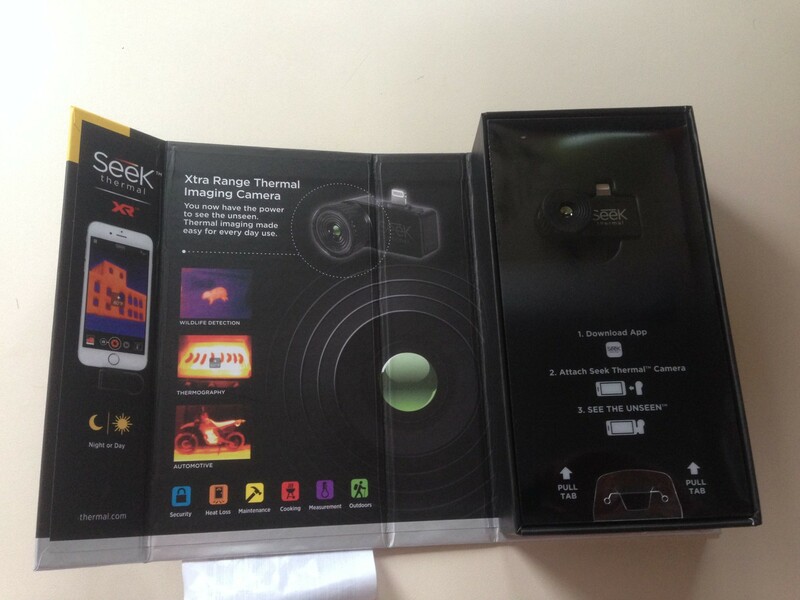 Now the Seek Thermal – which was their first product – is called “Seek Compact” or “Seek CompactXR“. 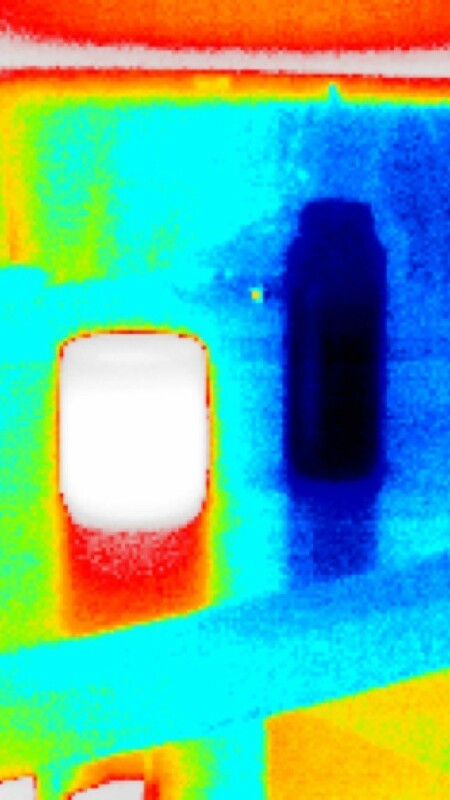 The thermal imaging camera is compatible with many Android and iPhone devices and is connected to the mobile phone at the bottom of the Lightning / Micro-USB connector. The packaging fulfills its purpose and refers to the homepage and the app for more information. The storage box is very stable. Worthy of note are the very stable storage box (included) and the robust housing of the camera itself. 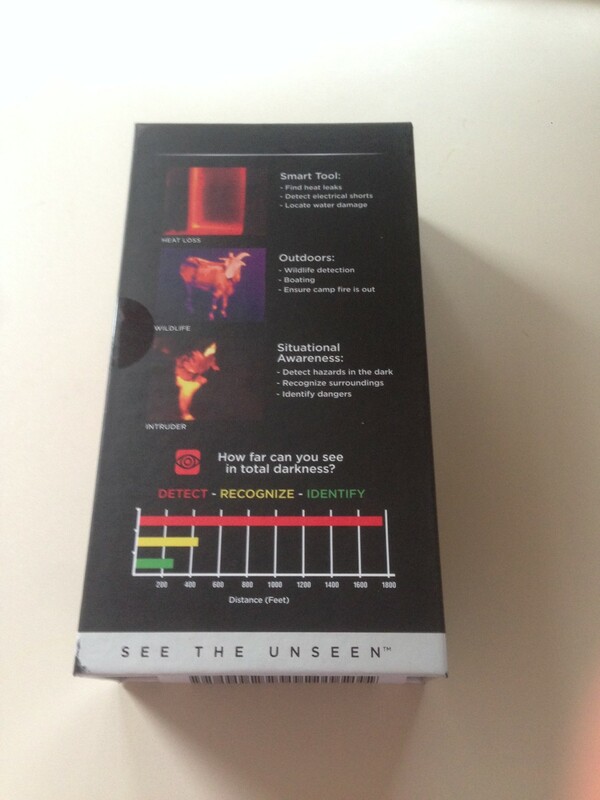 The manufacturer states that the transport box would even be waterproof – a plus for that too. Closing the box really takes some forces and an accidental opening will surely not occur. 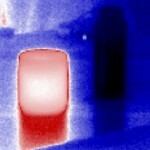 The thermal imaging camera itself is almost so small that you have to be careful not to lose it. It survived a small fall in the test without damage. It fits into every trouser bag and can be carried along everywhere. If you need it, just plug it into your iPhone or Android phone and off you go. 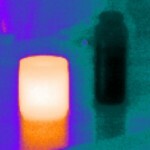 Perfect for DIYers who want to have a thermal camera always at hand. Because of its compact dimensions, it fits into every pocket. 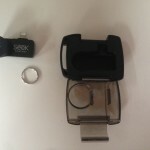 Also a small ring which fits the eyelet of the case is supplied and allows the attachment of a wrist band. With a sweep to the right you enter the app. The iPhone immediately recognizes the device and offers to load either the appropriate software from the app store, or – if already installed – start the app. Plus points for the well-integrated app. For Android users there is, of course, equivalent in the Play Store of Google you find the appropriate app. Interestingly, the camera can be connected to the iPhone in two different ways. Since the lightning connector is symmetrical, you can connect the camera to face the front or in the Selfie mode to face the user. Unfortunately, a click sound can be heard every two seconds, which might be annoying to some. This is the self-calibration of the sensor and leads to a very short interruption of the video during the video recording. 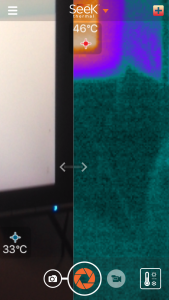 Other thermal imaging cameras also carry out this calibration, but the wth Seek Thermal Compact this is acoustically noticeable. 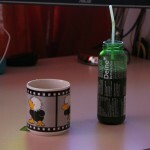 In the photo recording, however, this is not visible and does not interfere. Fits on the iPhone 5 despite having a protection case. The default model has a fixed focus and does not have to be adjusted in any way. 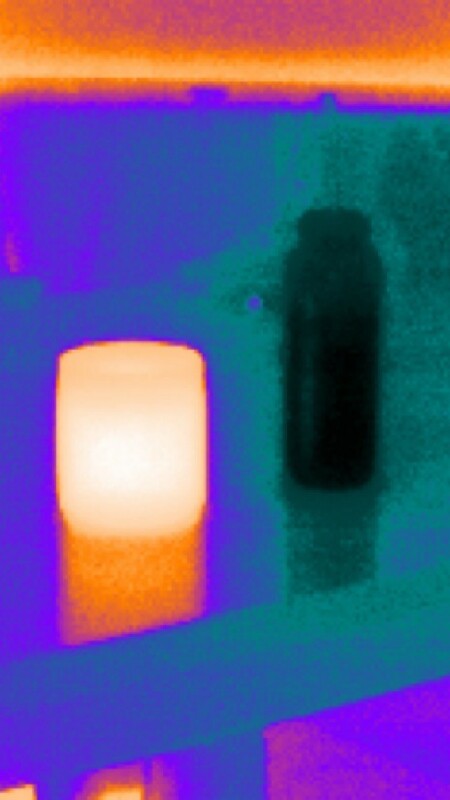 This simplifies operation because you can concentrate fully on the thermal image. In the extended-range variant, the lens can be modified at the front by means of a rotary wheel so that a clear image is obtained. This may take some time, but the sharpest setting is usually unambiguous. The XR version can therefore cover a much higher viewing depth and also has a smaller FOV. Although the sensor resolution for a smartphone attachment is very high, a true image fusion would have been desirable. 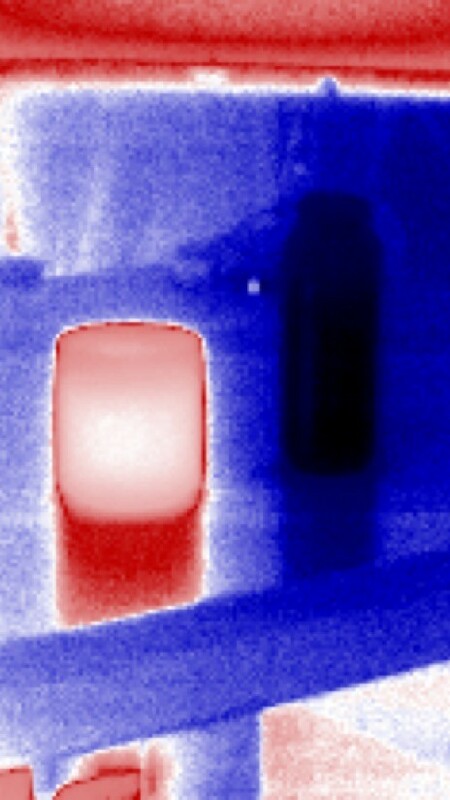 This helps to recognize the objects in the IR image. 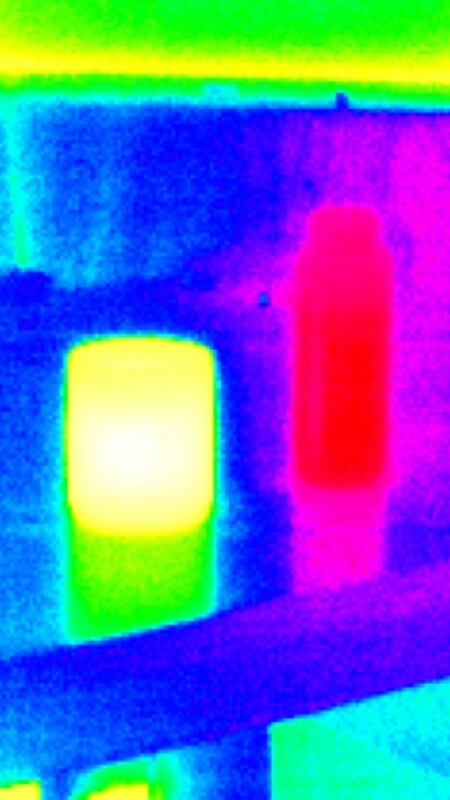 The thermal images of the Seek Thermal are somewhat grainy, but a smoothing by software can be activated in the menu. 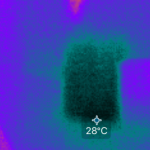 Despite frequent self-calibration, the temperature detection is somewhat inaccurate, but this does not affect the image itself. The relative measured values were well recorded in the test. 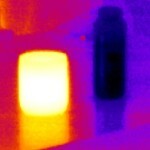 The thermal sensitivity of the thermal imaging camera is therefore praiseworthy. An adjustment possibility for the emissivity coefficient would have been good and probably would have improved the absolute readings. By default the temperature information does not rotate. The matching smartphone app has a wide range of settings, for example, a temperature threshold can be set, from which only hotter temperatures are marked. Min / Max detection is also possible. 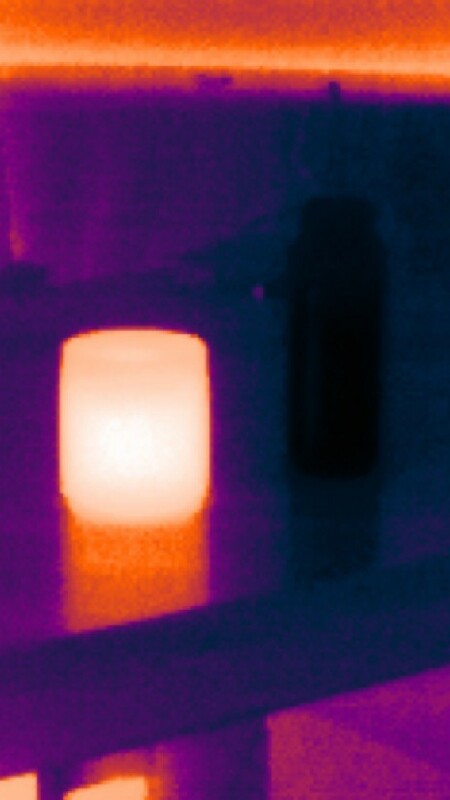 The temperature detection does not normally rotate when you turn the smartphone by 90 °. You must deactivate the rotation lock of the smartphone separately. 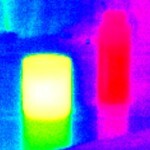 There are minus points for the high current consumption of this thermal imaging camera module. 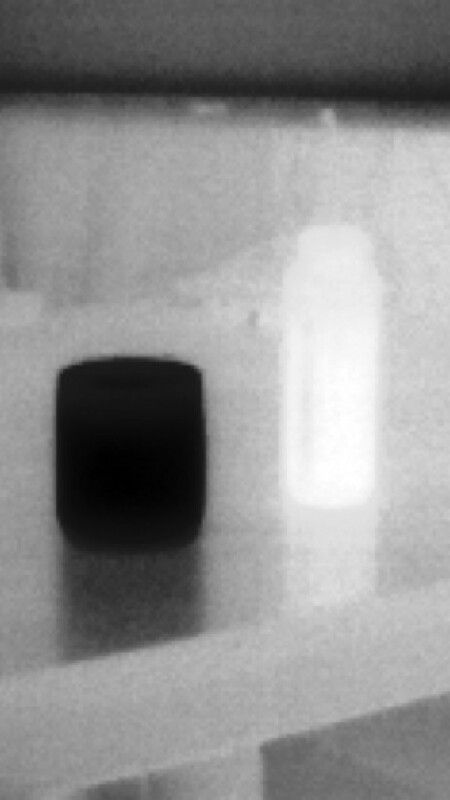 An iPhone 5 battery with the Seek Thermal does not last very long. If you really intensely take many pictures and videos, it may die after half an hour already. You should therefore have a charger at hand. As a small trick you can also go into the airplane mode and the turn the display brightness down to save additional power. 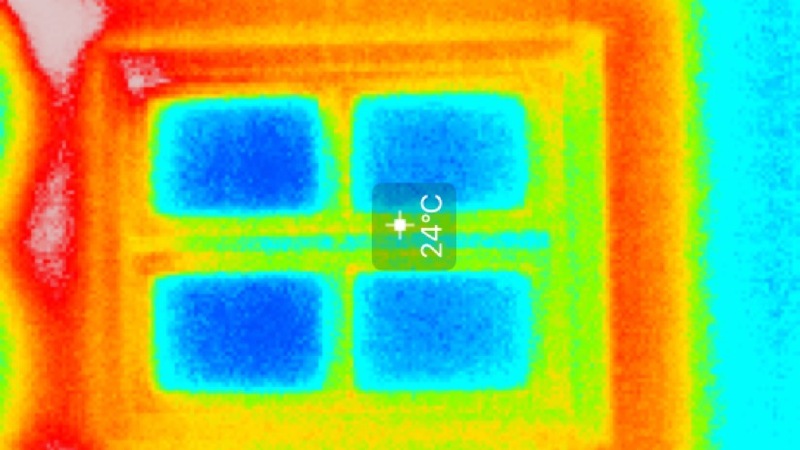 Window recorded with the Seek Thermal. 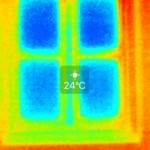 This priceworthy thermal imaging camera already provides quite decent pictures of windows in interior spaces. Thus, first statements about the state of the insulation and sealing can be made. In any case, the standard version of the Seek Thermal Compact is an advantage if you have little space. 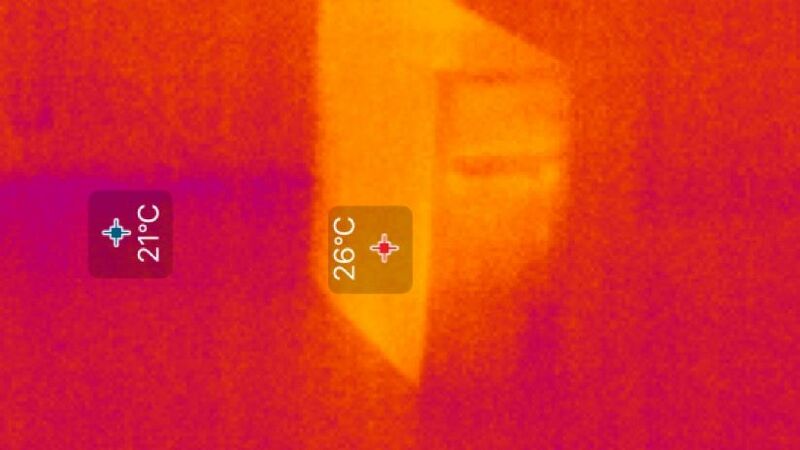 The thermal imaging camera operates at night as well as during the day because the sensor detects only the infrared radiation. But it is safe to say that you can create better pictures in winter. Particularly in the case of outdoor photographs of buildings, thanks to the higher temperature contrast, the details are also better. Also in the search for animals or persons the application in winter get easier. A body with 30 ° C (86° F) can be detected quickly on a 2 ° C (35° F) background. However, if solar parks and solar modules are to be investigated, they should be already warm, in other words, they should be providing power so that thermal conspicuities can be discovered. 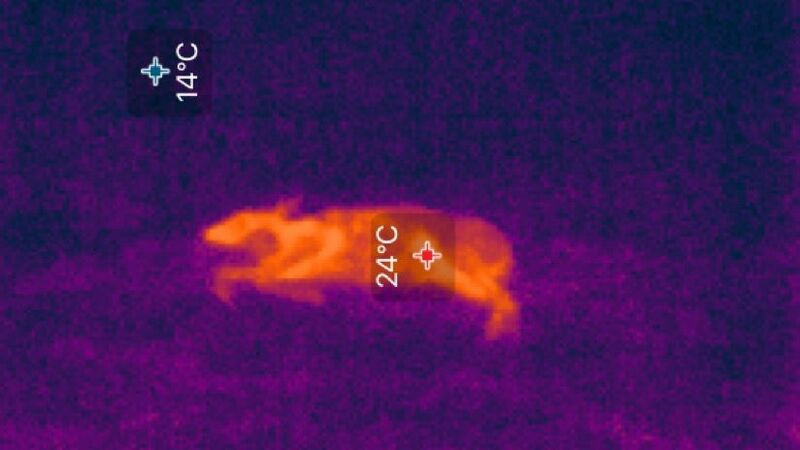 With a resolution of 206 x 156 pixels, it is comparable to conventional thermal cameras in the beginner’s range, but is among the smartphone attachments one of top riders. 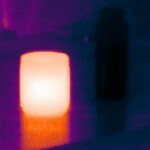 In fact, the device is relatively cheap, since thermal imaging cameras can cost several thousand dollars quickly. Both versions have a detectable temperature range of -40 ° C to 330 ° C (-40° F to 626° F)which is very good. The associated wavelength range goes from 7.2 μm to 13 μm. Also, both version are separately available for a number of Android smartphones and iPhones. In the standard version, the field of view is 36 ° and in the Extended Range version 20 °. 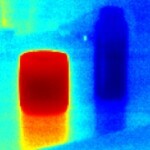 With a weight of only 14 g and a size of 4.4 x 2.5 x 2.5 cm, it is perhaps the smallest thermal imaging camera on the market. Rang of the Seek Thermal XR. The range of the standard version is indicated by the manufacturer with 304 meters (997 feet). In comparison, the XR with 548 meters (1798 feet) has almost twice as much. However, a distinction must also be made between “detection”, “recognition” and “identifying”. 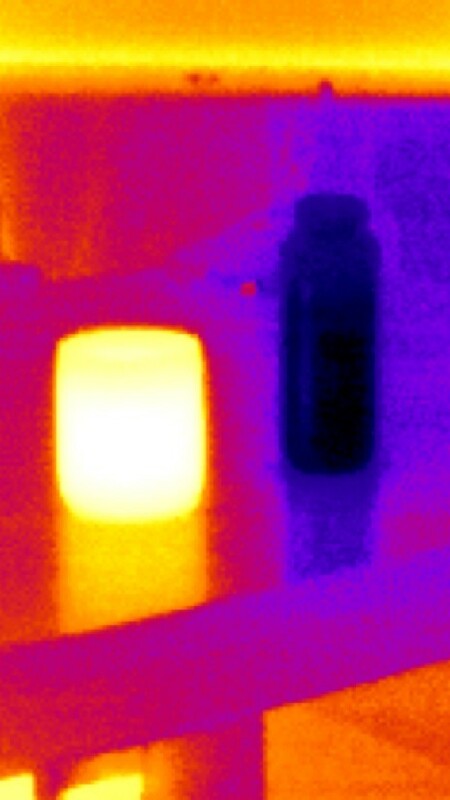 The app allows numerous settings for the thermal imaging camera. The display can be configured so that the corresponding areas are marked in color only below or above a threshold temperature. 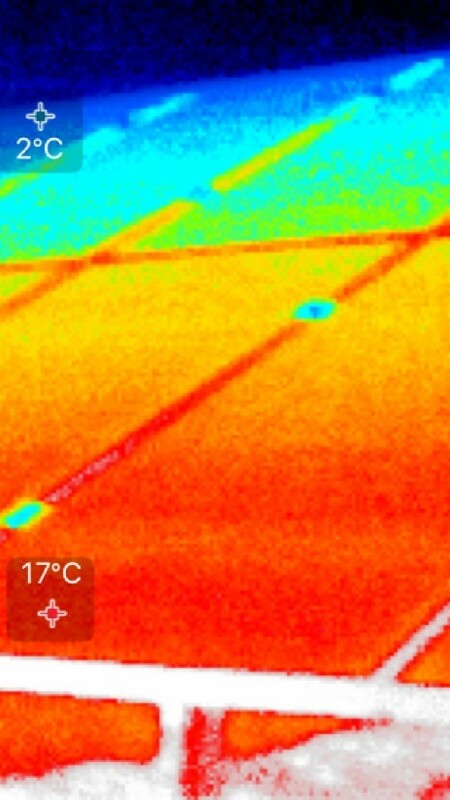 A color highlighting of an isotherm is also possible. Very useful is the activatable function for automatic marking of the warmest and coldest point in the picture. 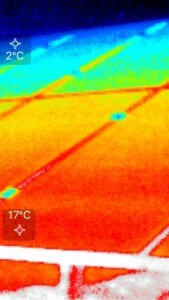 A simple temperature measurement in the middle of the image (crosshair) is, of course, also possible. However, a scale of the covered temperature range is missing. The switching between picture and video mode is easily done with a button. We were not able to determine a limitation of the recording time in the test, but is probably limited by the battery life time or memory. Celsius, Fahrenheit and Kelvin are available as temperature units. The display format can be selected as desired between 16: 9 and 4: 3. 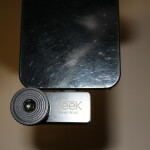 The date and time as well as GPS coordinates and the Seek logo can be displayed as watermarks. Geo tagging of the JPEGs can also be activated seperately. 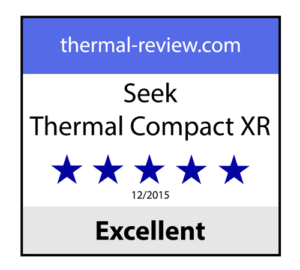 This is, of course, very good for the price category of the Seek Thermal Compact. Another advantage of this thermal imaging camera is that it has a range of color palettes to choose from: White, Black, Iron, Cool, Amber, Indigo, Tyrian, Glory and Envy “. This leaves nothing to be desired. The “White” or “Black” color palette is ideal when you need visual aid in the dark. But if you want to detect a living object from a distance, the range “Glory” is quite good, although it tends to be more of a noise. “Tyrian” provides relatively familiar images are easy to interpret by humans. The color palette “Amber” has done quite well when examining a car in the workshop. Also on the solar park “Amber” is perhaps the best setting to detect defective cells. What did not work properly in the test is the image blending. In the app you can connect the visible image of the digital camera integrated in the smartphone next to the IR image. 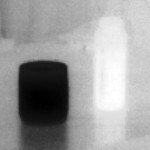 These are then next to each other and the “partition” can be moved arbitrarily between the IR image and the visible image. The display of the two, side by side, however, always remains horizonal – no matter how the smartphone is rotated. Unfortunately the combination of the two pictures is not usable. 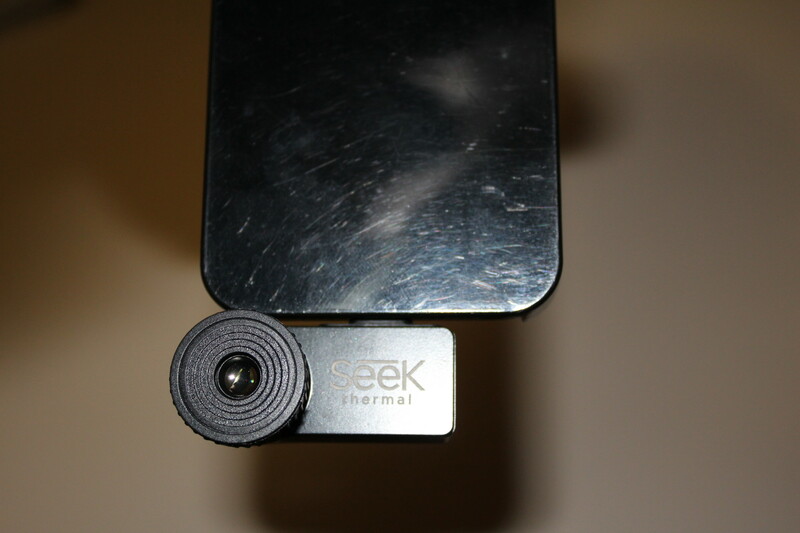 Seek has probably had to calibrate for each smartphone, since the IR sensor and CMOS sensor are different from mobile to cell phone far away. This is of course very difficult and does not work in our test with an iPhone 5 simply not. Other users report similar experiences with this display mode. 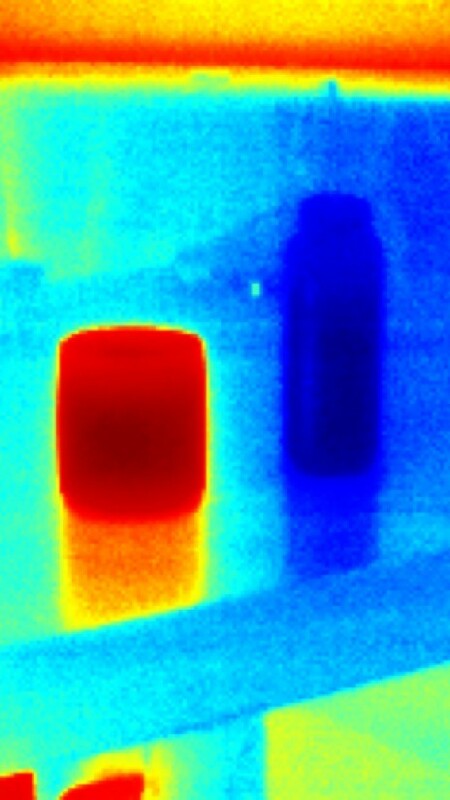 Other thermal imaging cameras solved the problem by integrating the IR sensor and the digital camera sensor together. Also an additional calibration option and adjustment of the object distance is not unusual. This picture-in-picture function of Seek Thermal is probably nothing more than gimmick, and has no practical use. It is better to just simply take a separate photo of the examined object with the mobile phone or a DSLR. The camera can also record video, but the refresh rate is 9Hz maximum and no sound is recorded. 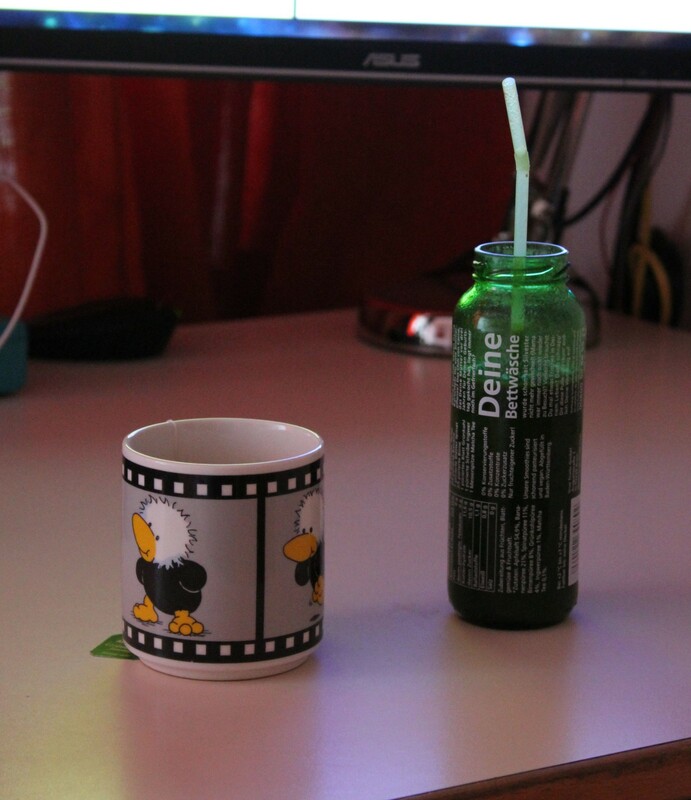 In our sample video, jerking (calibration) can be seen during recording. Otherwise, the picture quality of the video is relatively good and not blurred. The 50 second test video requires about 19 MiB on the iPhone. The standard version is suitable where a large field of view is desired. So in interior rooms and when examining technical equipment. The model is also ideal for controlling control cabinets and fuses. The strengths of the Extended Range version lie in the high depth of view. Because of the adjustable focus, it is ideal for monitoring a terrain or when looking for animals. Even at hunting it is helping to find the killed game again. The range is very high and people can also be discovered behind bushes and branches from a great distance. If you want to examine electronics, the XR version is also preferable. The focus is simple for a close-up and the expert can recognize and examine even the smallest SMD building blocks. If, however, a window is to be examined, a distance of at least 4 meters is necessary, which is often impractical. Then the choice of the standard version is better. Both versions are very well suited for the investigation of solar parks. You can quickly detect major failures and, if necessary, investigate them more closely. 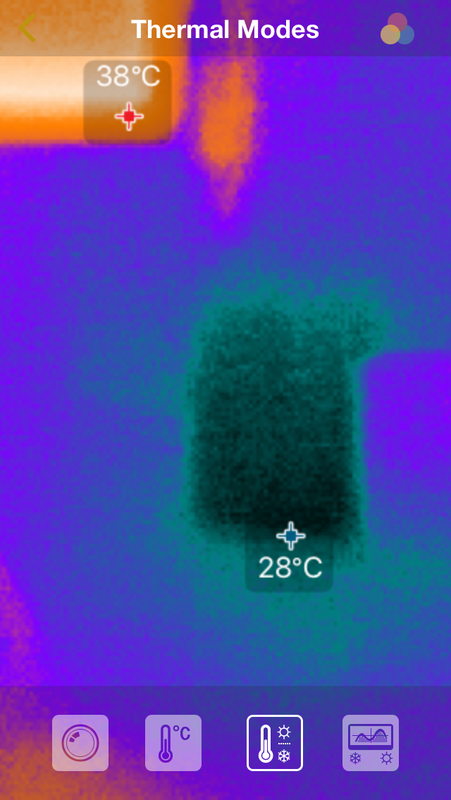 It is worth mentioning that there is a commercially available mounting frame for this thermal imaging camera, whereby it can be mounted on a camera tripod. Via an extension cable it can then be connected to the smartphone. This makes sense if you want to produce high-quality images and want to keep the captured viewing angle and section. If the camera is kept very quiet during shooting, you really get the maximum out of the picture quality. 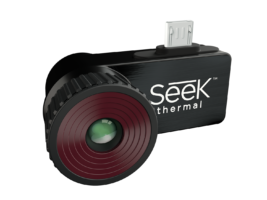 The Seek Thermal Compact can be upgraded technically for a small amount of money and is a great entry device for thermography. It has a few small weak spots like the high power consumption, and the missing image combining. Except for that, the recordings are quite useful and can be compared with very expensive thermal cameras. One can say that the standard version is more for inside and the XR version for the outside usage. Therefore, if you need even more performance in terms of visual depth, you would be well advised with the Extended Range version. This model is just right for property protection and hunting.